Hell Freezes: Interval Training on Android – Zombies, Run! The four-minute mile. A man on the Moon. A zombie running game that actually helps you get fit. They said it could never be done. 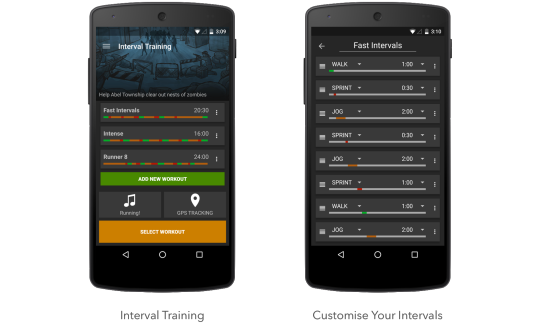 But now it’s here: Interval Training on Android! In v4.2.1, you can create custom interval training workouts with a mixture of walking, jogging, and sprinting, and we’ll wrap a story and audio around them. Interval training – where you sharply increase your speed for short amounts of time – is a great way to improve performance. That’s why we built in zombie chases into story missions. But if you have more specific training needs and you want to have precise intervals at different paces, our new Interval Training mode is for you. Interval Training is available to all Pro Members right now – and even better, if you’re a Legacy Member, you also get it for free!